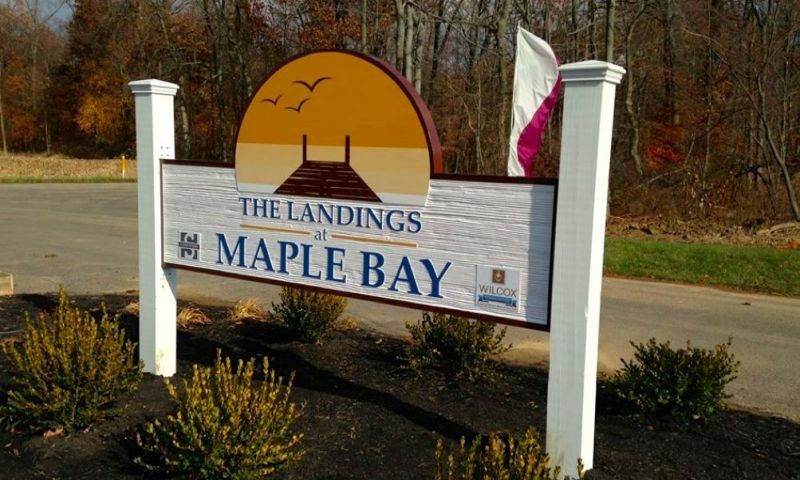 The Landings at Maple Bay is an active lifestyle community in Hebron, Ohio. This beautiful lakeside resort-style neighborhood features a clubhouse, private harbor and boat docks as well as low-maintenance attached homes. Located along the picturesque Buckeye Lake, The Landings at Maple Bay is sure to be the ideal community for homeowners seeking a carefree waterfront lifestyle. Homeowners will enjoy the proposed clubhouse at The Landings at Maple Bay. The clubhouse will feature great amenities where residents can socialize or stay physically fit. There will be an exercise room with cardiovascular and strength-training equipment, and a social room where homeowners can hang out. Outdoors, residents can swim in the heated pool and relax on the spacious patio. Homeowners will enjoy the scenic lakes as well as access to the private five-acre marina where they can dock their boat. Construction of The Landings at Maple Bay began in 2012 and plans to have 176 ranch-style homes upon completion. The Landings at Maple Bay consists of luxurious attached homes with low-maintenance exteriors that offer 1,568 to 2,052 square feet of living space. They have two bedrooms, two or three bathrooms, and an attached two-car garage. These homes will feature Nantucket-design exteriors and many homes will have harbor, wetland, or woodland views. Homeowners can choose from a variety of floor plans that feature open layouts, finished verandas, and private courtyards. Most home designs offer optional second-floor bonus rooms and bathrooms. Homeowners can choose from waterfront homes that come with a boat dock or off-water homes with the option to purchase a boat dock for an additional fee. Residents of The Landings at Maple Bay can enjoy their free time pursuing hobbies and interests on their own. They can start a club or organize an activity with a neighbor. The options for leisure activities can be endless as the community continues to grow. The homeowners' association fee will include exterior-home maintenance that residents are sure to appreciate. Ideally situated along Buckeye Lake, residents have easy access to scenic lakes for water sports and activities. There are also plenty of parks with biking and walking trails. Denison University is 14 miles away where residents can take continuing education classes or participate in social events. For big-city fun, downtown Columbus is 30 miles east. Interstate 70 is also close by, which makes trips to stores, restaurants, and attractions a breeze. The Landings at Maple Bay provides a maintenance-free living in a quiet lakeside setting in Licking County, Ohio. Check back soon for more information on the lifestyle in The Landings at Maple Bay. Attached homes in The Landings at Maple Bay offer 1,568 to 2,052 square feet of living space. They have two bedrooms, two or three bathrooms, and an attached two-car garage. Most homes feature optional second-floor bonus rooms and bathrooms. Waterfront homes include a boat dock and off-water homes have the option to purchase a boat dock. 55places.com is not affiliated with the developer(s) or homeowners association of The Landings at Maple Bay. The information you submit is distributed to a 55places.com Partner Agent, who is a licensed real estate agent. The information regarding The Landings at Maple Bay has not been verified or approved by the developer or homeowners association. Please verify all information prior to purchasing. 55places.com is not responsible for any errors regarding the information displayed on this website.